While it seemed half the country went on vacation in recent weeks, I'm settling in for a month at home, working on a variety of projects-in-process, playing a run of local gigs with Bay Station and getting out to other events and shows. Hope to see you! Recent travels have inspired new material! The Love the Bay sailing and music party was followed by a residency run up to Oregon and a trip to Southern California featuring a fun appearance at JC Hyke's Songwriter Serenade. Next week, I'm pleased to be playing a selection of the new songs as well as some vintage tunes at two talent-packed showcases in Oakland and San Francisco. Come on out! Wow, what a ride the past weekend has been. Bay Station completed our mission on Memorial Day, sailing from Richmond to Alameda after a music-filled few days with some of our favorite friends in music. Below is just a sampling of some of the tiny boat concerts staged on Espresso. Check out the Bay Station Facebook page for full videos! Thanks to all those who participated! 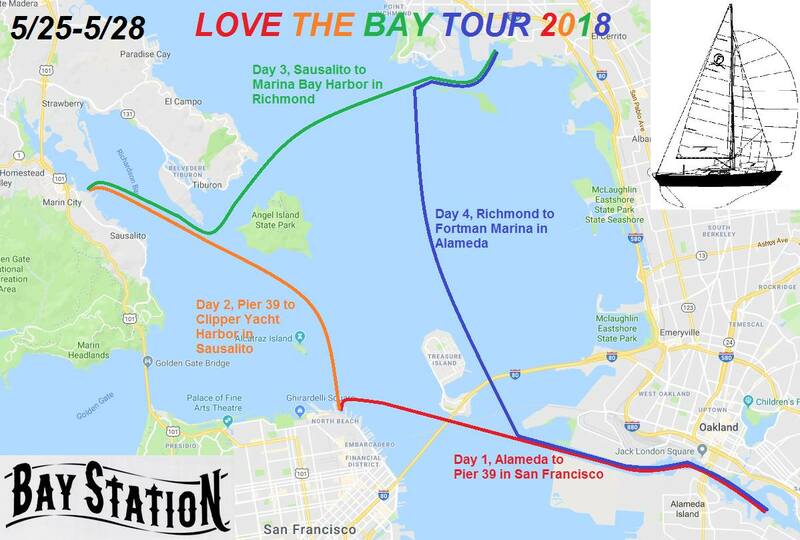 Bay Station is setting sail from Alameda on our second Love the Bay multi-day sailing trip/tour of the San Francisco Bay. Follow along on Facebook and/ Instagram this Memorial Day Weekend for live broadcasts from our various ports of call.